August 3, 2018 August 3, 2018 InderjeetLeave a Comment on ‘Fanney Khan’ steals 3.5/5 with its comic and emotional sides despite unreal climax! Plot: ‘Fanney Khan’ seems very emotional and comic despite too much dose of back to back songs in the first half which makes you feel a bit over-musical and after few songs, movie gets a grip of comic tuning of Rajkumar Rao as Adhir and Anil Kapoor as Parshant Sharma aka ‘Fanney Khan’ alongside emotional but sweet and sore relationship between father & daughter. Fanney Khan, who is an orchestra singer wants to be rockstar of 70’s era but couldn’t be due to poverty and domestic compulsions but now wants his daughter, Lata Sharma played by Pihu Anand to be a famous singer as Baby Singh played by Aishwarya Rai Bachchan but history repeats itself and Fanney gets broken inside. Then kidnapping of Baby Singh happened by Fanney and Adhir for some favours and story keeps moving towards climax and climax makes you a bit disappoint due to some unreal factors and scenes. 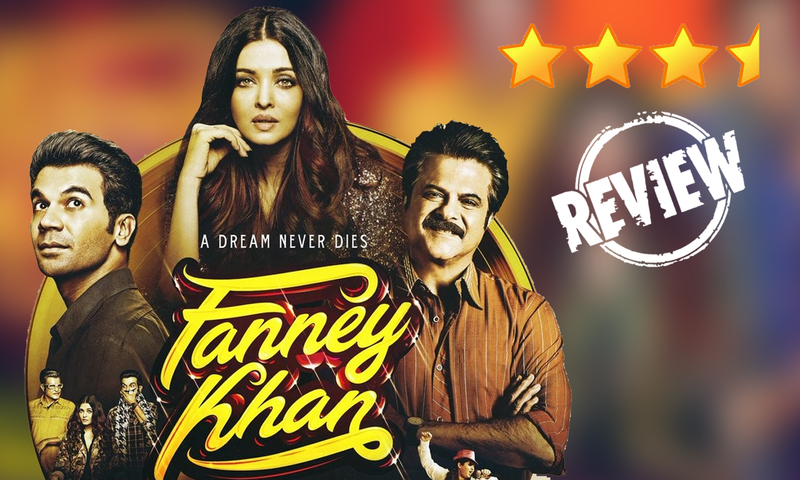 But Fanney Khan makes you leave the theater with a positive review. Screenplay: Screenplay is very engaging and interesting apart from some frequent tracks in the starting 20 mins and for unreal climax. Performances: Anil Kapoor as Parshant Sharma aka Fanney Khan gets 5/5 for his dramatic friend and emotional father performance. Rajkumar Rao steals your heart with his innocence as Adhir and makes you smile whenever he appears on the screen. Pihu Anand as Lata has done a fine job. Aishwarya Rai Bachchan is looking a real star as Baby Singh and completes the glamorous feel of the film. Rest of the cast is fair enough as Divya Dutta, Satish Kaushik, Girish Kulkarni etc..
Music: Amit Trivedi and Tanishk Bagchi gave a very soothing and musical touch, which was required. Direction: Atul Manjrekar is quite perfect as this was his duo but you hardly feel that due to his hard efforts.